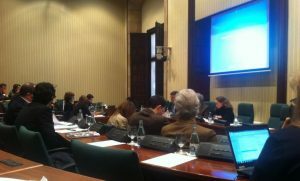 Solidarity and Cooperation Committee of the Parliament of Catalonia unanimously approved the draft resolution on strengthening of health workers in developing countries, at the request of pharmacists Mundi and Medicus Mundi Catalonia. The draft resolution presented by Initiative for Catalonia Greens-United and Alternative Left has received the support of Convergence and Union, the Socialist Party of Catalonia, the Popular Party of Catalonia Republican Left of Catalonia and the Joint Working Group after the change initial drafted several amendments CiU and PSC. Point 1. Dedicate a percentage of Official Development Assistance in Health, approved by the Council of Cooperation Department, strengthen human resources, following the recommendations of WHO in training and retention of human resources. Point 2. Support coordinated the development and implementation of national strategies and plans for health human resources in developing countries, the priority for cooperation Plan for 2011-2014, which are comprehensive and robust. Point 3. Make the necessary arrangements with the Government of the State, as from relevant international organizations, adopted measures to maintain and increase gradually if necessary, hiring and / or the salaries of health workers in countries suffering from a shortage of human resources in this sector, in order to discourage their march into other countries. Point 4. Implementing the Code of Good Practice WHO, among other things, requests the Member States not to carry out active policies in the public sector to incorporate health personnel such as recruitment source, for professionals of any of the 57 poorest countries. Do the same recommendation to the private sector. Point 5. Implement the Code of Good Practices WHO, among other things, requested member countries quantification of existing human resources in the field of health, planning how many need it most and a strategy for training and “loyalty” of the staff already trained. Other exciting details are provided for Mobdro on Facebook which is a great source to use. 6. Promote point plan of coordination between those responsible for the Catalan Cooperation Agency and the Department of Health to take into account the needs of developing countries, providing effective and appropriate technical assistance, support retention and training health personnel in the countries of origin, transfer of technology and knowledge and promote circular migration mechanisms. Since the two NGOs, pharmacists Mundi and Catalonia are happy medicusmundi the approval of the proposed resolution and the amendments of the transaction, since it removed the fourth point is the key to solve the deficit health personnel in developing countries. We hope that the future will take this proposal into consideration and prosper in the implementation of the Code of Good Practice, as well as the level of coordination between the ACCD and the Department of Health.